Chadron Community Hospital staff members along with Pinky the Elephant visited Chadron Primary School to talk about poison prevention. The children were treated to coloring books and magnets with the visit and we want to thank Chadron Community Hospital for the coming to the "Nest". These Primary students celebrated perfect attendance for the first three quarters of school. We are so proud of these children and their families for making attendance a priority. It is not easy to make every day of school so when you see these students please make sure you congratulate them for a job well done!! These students were chosen by their teachers as wonderful examples of students who follow the Cardinal Rules of 1) Be Safe, 2) Be Respectful, and 3) Be Responsible so they were able to party in the teachers' lounge with only Princessipal Uhing. As Cardinals of the Month they are great leaders within their classrooms. It is always so much fun to visit with and enjoy the company of these outstanding students. Way to go kiddos and thank you for making such good choices!! The students at Chadron Primary School had a variety of activities to help celebrate Read Across America. Kindergarten students enjoyed the Q and U wedding while older students had visitors from the Pine Ridge Job Corps and other students did some reading of Seuss books on their own. It was a wonderful day to celebrate literacy and enjoy our guests. Thank you to everyone who visited and participated in our fun! The second grade classes were able to visit First National Bank of Chadron for a field trip a few weeks ago. First National Bank of Chadron sponsored a math curriculum - "Saving with Mandy and Randy" in which the students learned about saving and spending along with deposits and withdrawals. The children were excited to see how the bank operates and we thank all of the employees of the bank for welcoming our students. Thank you! 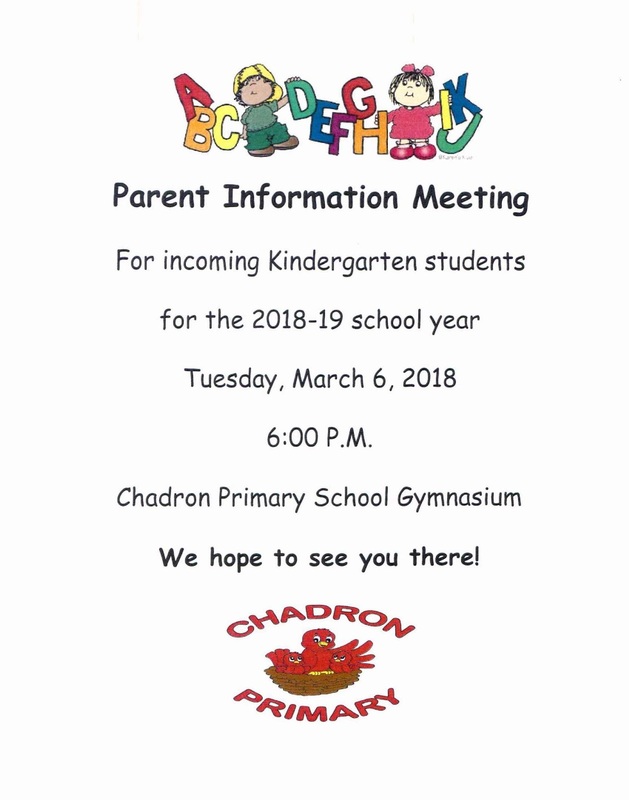 Incoming Kindergarten Parents - Please Join Us! Polar Plunge to benefit Special Olympics and the Nebraska law enforcement torch run! All proceeds will go to our local special Olympics team and the Nebraska law enforcement torch run. Chadron Primary School would like to extend a HUGE thank you to the families, staff members, volunteers, and businesses who made our 2nd Annual Penny Carnival a success!! The Parent Involvement group met and began planning this fall and through the generous donations from businesses and volunteers we were able to have a fun filled evening. This year's theme was "We Stick Together Like Legos" and families enjoyed games, snacks, and fellowship. Once again, thank you to everyone who planned or participated in this event. Mrs. Larson’s Class Breaks Out!! 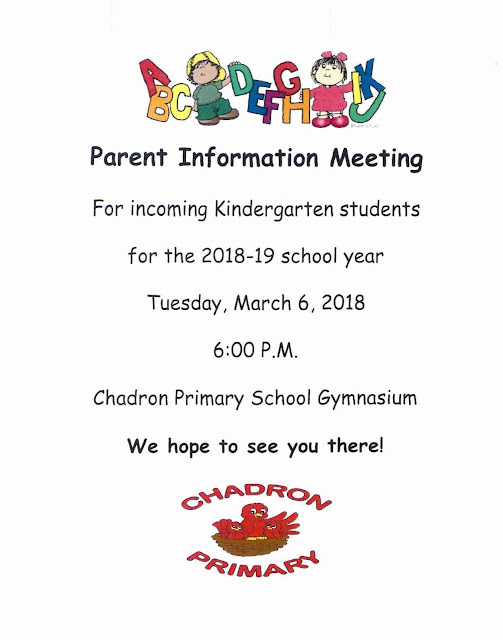 Chadron Primary School would like to send a special thank you to Board Members Amanda Bannan, Tom Menke, and Sandy Roes for taking time out of their busy schedules to come read to our students. Media Specialist Cathy Kaus organized the event for the night of Parent/Teacher Conferences and we were certainly excited to have board members in our schools interacting with our children. Again, thank you to Mrs. Kaus and board members for all you do to make Chadron Public Schools such an AMAZING place! !